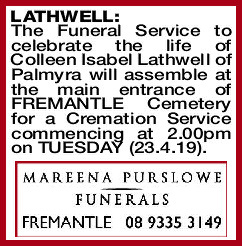 The Funeral Service to celebrate the life of Colleen Isabel Lathwell of Palmyra will assemble at the main entrance of FREMANTLE Cemetery for a Cremation Service commencing at 2.00pm on TUESDAY (23.4.19). To Dear Greg, Jo and Abbie and all the Family members. 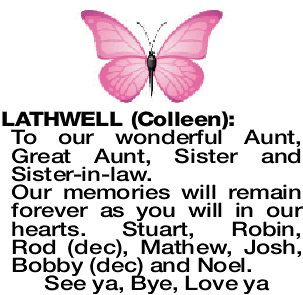 Our deepest sympathy and sincere condolences on the passing of your mum, mum-in-law, loving grandmother and sister, Colleen. She fought a long battle but can now rest peacefully. 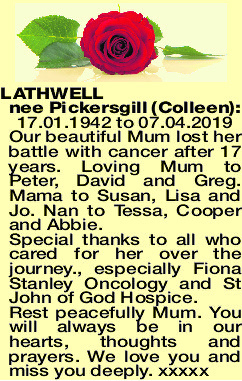 nee PICKERSGILL COLLEEN 17.01.1942 to 07.04.2019 Our beautiful Mum lost her battle with cancer after 17 years. 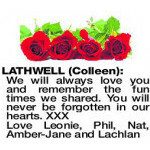 Loving Mum to Peter, David and Greg. Mama to Susan, Lisa and Jo. 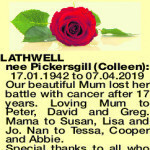 Nan to Tessa, Cooper and Abbie. Special thanks to all who cared for her over the journey., especially Fiona Stanley Oncology and St John of God Hospice. 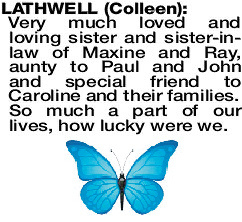 Very much loved and loving sister and sister-in- law of Maxine and Ray, aunty to Paul and John and special friend to Caroline and their families. So much a part of our lives, how lucky were we. 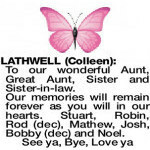 Everloving Sister and Sister-in-law of Gail and Lee, Aunty to Bradley, Danielle and Families. The family memories and ties that bind us cannot be broken. 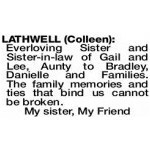 To our wonderful Aunt, Great Aunt, Sister and Sister-in-law. 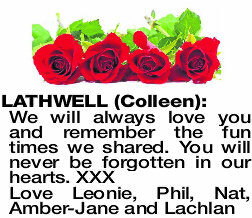 Our memories will remain forever as you will in our hearts. Stuart, Robin, Rod (dec), Mathew, Josh, Bobby (dec) and Noel.